Actress Aishwarya Rai Bachchan, who is expecting her first child with Abhishek Bachchan, has been admitted to a hospital here in suburban Andheri. She was admitted to the Seven Hills Hospital in Andheri late last night,her parents and brother and big b family including shweta are also went to hospital with ash at night. 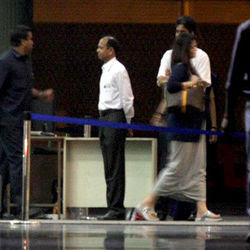 At around 2 am Big B and father-in-law Amitabh Bachchan tweeted, "A day of expectation....but another day! The lord has his way and they are most special....we wait!!." Last week, Aishwarya had visited the hospital for her regular check-up.